SMOK proudly continues to culminate the latest technologies in striking fashion with the release of the SMOK Species 230W TC Kit. This kit is designed to catch the eye with a brawny shape that resembles the armor of a warrior from outer space. The Species Box Mod has an overall angular outline with stark trim that gives the device divine sophistication. This Zinc Alloy constructed chassis stands at compact dimensions of 82.1mm x 49mm x 30.6mm with a lightweight of 155g. The back of the Species Mod has SMOK’s popular Cobra print that gives this device a fine grip to prevent the device from slipping out of your hand. Along the side of the device is an elongated firing bar that is clicked five times to turn the device on and off and clicked three times to lock itself from firing accidentally. The front of the Species Mod features a 1.45-inch TFT full color high definition touch display screen, a single button, and a Micro-USB port. The HD OLED touch screen utilizes an upgraded user interface to provide you with clear, comprehensive data and several available settings as well as output modes. The single button on the chassis is a screen locking mechanism located beneath the display so you can put your device in stealth mode and not have to worry about hitting buttons while you vape. Initially, the full color TFT screen displays wattage, resistance, voltage, a puff counter, puff timer, and dual battery life indicators. Navigating to the next menu, you gain a more interactive experience with four available settings- screen setting, puff setting, system setting, and output mode setting. Screen setting allows you to personalize the screen display with six available color options and you can change the amount of time (in seconds) that the screen stays on without being touched. Puff setting allows you to monitor your draws so you can limit your vapor intake by setting a maximum puff count or refreshing the counter if you want to keep vaping System setting shows you the UUID of your device and allows you to fine tune your resistance or return your device to its factory settings. Available output modes on the SMOK Species 230W TC Box Mod include Variable Wattage mode and Temperature Control mode. In Variable Wattage mode you can set your wattage from 1-230W and your preheat effect from Soft, Normal, Hard, and Max all within resistances of 0.1-2.5 ohm. The Temperature Control suite allows for temperatures between 200-600F (100-315C), heating elements of Ti, Ni200, and SS, and access to the TCR function all within resistances of 0.05-2.0 ohm. Powering the Species 230W TC Kit are dual 18650 batteries (not included) that are installed through a bottom hinged battery access door. These batteries give the Species Box Mod an input voltage of 6.4-8.4V, an output voltage of 0.5-8.2V, a 5V charging voltage, a 1.8A charging current, and a standby current of less than 500uA. SMOK has conveniently given this mod a Micro-USB port to not only charge your batteries but to also upgrade firmware as it becomes available. Safety features of this mod include intelligent atomizer recognition, puff monitoring system, ten second cut-off, short circuit protection, over-heating protection, and over discharge protection. A center mounted Gold-plated 510 connection allows the Species 230W TC Box Mod to accommodate for 30mm tanks without significantly visible overhang. Attached to the SMOK Species 230W TC Box Mod using a standard threaded 510 connector is the all-new SMOK TFV8 V2 Sub-Ohm Tank. This tank has a lightweight of 65g composed of superior Stainless Steel at 54mm x 25.4mm and durable Pyrex glass that extends out to 30mm. On top of the TFV8 V2 is an exclusive new press on 16mm Delrin drip tip that will positively increase airflow and reinforce your desired draw effects. Below the mouthpiece is a rotary top cap for convenient top filling into the large 5mL bubble glass tube. If you prefer standard glass tubes, SMOKtech has also made available a TPD compliant 2mL glass reservoir. To fill the reservoir press the push button just below the top cap and spin the top cap counter clockwise, exposing the large mouthed fill port. Unlike previous SMOK tanks, there is no fill port gasket but rather a gasket on the underside of the top cap to tighten up the tank and prevent leakage. Pre-installed within this tank is a SMOK Baby V2 A1 Coil Head rated for use between 90-140W but recommended for best use at 110-130W. This 0.17 ohm single coil has Kanthal heating material in a mesh design to create an extremely large heating area. This kit also includes the SMOK Baby V2 A2 Coil Head rated for use between 50-80W but recommended at 65-75W. The SMOK V2 A2 has 0.2 ohm dual Kanthal heating cores in a Cobra/ prismatic design to boost airflow within the atomizer. Both of these coils contain antibacterial medical grade Cotton instead of natural Organic Cotton so they can hold moisture for longer periods of time. Assisting with the airflow intake are triple bottom adjustable airflow slots that are much larger than usual to provide you with a unique experience. No matter which coil you use, the TFV8 V2 Sub-Ohm Tank, along with the Species 230W TC Mod, will provide you with massive cloud production and optimal flavor enhancement. If you enjoyed the original TFV8 Baby Beast Sub-Ohm Tank or you like to keep up with SMOK’s relentless output of powerful devices, then this is the kit for you. 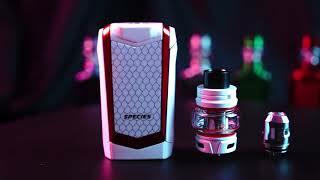 On the other hand, if you haven’t liked many of SMOK’s kits in the past, then try the SMOK Species 230W TC Kit because they have listened to the people and implemented much needed improvements. Available in several eye-catching colors, SMOK offers the personal touch you’re looking for in a device.